It’s an exciting moment to be selling your home. You’ve decided to move onto new possibilities somewhere else, and you’ll be purchasing a new home later, too. What’s important right now, however, is that you find a way to increase the value of your home so that you can sell it fast and for top dollar. It’s not easy upgrading, renovating, or remodeling a home to increase its value, but you will find seven tips in this post to get started. You may believe you can take care of the “staging” yourself, but it pays to hire a pro — especially a pro from the Bellevue area. You want a local expert who has years of experience staging homes for those looking to sell fast and for top dollar. You can paint the exterior and interior of you home to give it a nice face lift. Stick with the original colors or spend the time to decide on new colors. The fresh coat of paint will give potential home buyers the feeling that they’re purchasing a newer home. Although aesthetic upgrades and facelifts may seem like the best first move, consider getting your home inspected. Not all home value adds are in sight. In fact, if you do not know it exists, you cannot fix it. An outdated electrical system, termites, or mold can all sink your home selling ambitions. Get an inspection and take care of what your inspector finds as soon as possible. Once again, hire a professional home energy efficiency expert to inspect your home. This will give you inexpensive upgrades to your home to lower future utility bills, which is a huge selling point for home buyers. They want to know what they will pay on average in utilities. If your home is at the bottom of that list for cost, it’s a great signal for home buyers to pay attention. When it comes to your home’s curb appeal, it matters much more than some home sellers think. The initial impression when a potential home buyer drives up to a home, gets out of their vehicle, and walks to the front door is where a majority of buying decisions occur. The huge island in the kitchen and the his-her bathroom sinks are bonuses compared to what the neighbors, family, and friends think about the home when they visit. Adding some low-cost landscaping features like potted plants, new mulch, or a tree can do wonders for your home. Do you have a patio in your backyard with nothing on it? Consider purchasing a simple table and chairs to fill the space. When space around a home is empty, it makes people feel the same way. A decorative seating arrangement can really tie together a patio. You do not need to remodel your bathroom entirely. Simply renovate it with aesthetic upgrades. Always hated the mirror in your master bathroom? Change it. Replacing tile can also give your bathrooms a refresh that help home buyers commit to the home. How old are the appliances, tile, and lights in your kitchen? Upgrading something as simple as your kitchen lighting can bring warmth to the room that really sings to home buyers. Furthermore, a simple tile, cabinet, or paint upgrade can work wonders for the space. 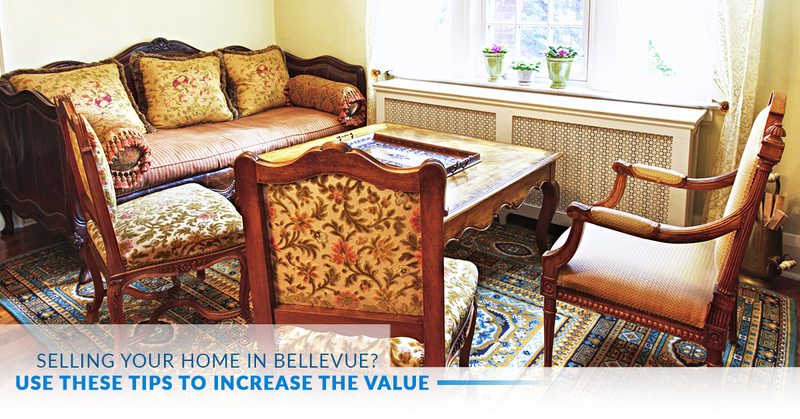 Once you’ve finished your home upgrades, renovations, or remodels, give your home staging expert in Bellevue a call. You need more than upgrades to sell your home, and IntExt Staging is here to help you so that you can sell your home fast and for top dollar. Not sure where to start with your home? We’re licensed contractors and can advise or organize any home upgrades you need completed. One call does it all!